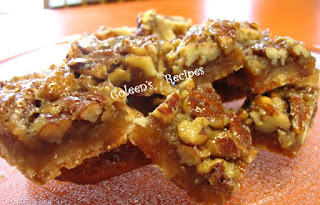 Picky-picky Hubby tells me these Pecan Pie Bites are totally addicting. They have a buttery shortbread crust ...... a slightly gooey center and glazed sweet pecans on top. What more can you ask for" Oh yes, they also freeze exceptionally well!!! Click on this photo to get a better look? Mix the above crust ingredients well and press into a 9" x 13" baking dish that has been lined with parchment or no-stick foil (see note below). This mixture will seem crumbly before you bake it, but don't worry about that. Just pat it evenly into the pan and bake in preheated 350° oven for 20 minutes. If you are using a glass baking pan, bake at 325°. Mix well and pour over partially baked crust, making sure the nuts are evenly spread out. Return to the oven and bake for 25 more minutes.